Visit the Nature Centre's Upcoming Events page (updated August 8) and ECFNC Activities page (updated September 27) for upcoming fall programs. Friday, September 27: The Chimney Swift count at Walkerville High School was down to about 86 tonight. The remaining swifts will soon be departing for South America. Saturday, September 21: Ojibway's field trip to Point Pelee today was rewarded with great views of Merlins including one perched for a nice scope view and a flight of three zooming low over our heads. Insects were also present in good numbers. In addition to the large numbers of Black Saddlebag dragonflies at the tip we also had a sighting of the rare Carolina Saddlebags. A very large flying insect turned out to be a Chinese Mantid. Butterflies seen today included Cabbage, Orang Sulphur, Clouded Sulphur, Buckeye (6), Monarch (20), Viceroy (2), Red Admiral (2), Comma (1), Least Skipper (3), Eastern Tailed Blue (2), Fiery Skipper (3) and the rare Variegated Fritillary (1). 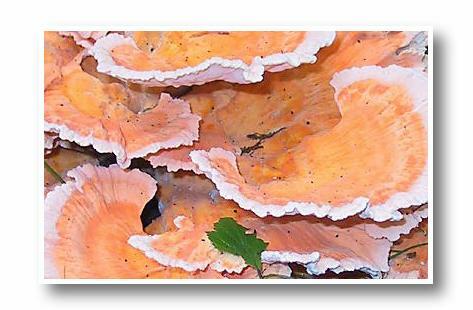 Friday, September 20: The mushroom outing scheduled for this Sunday has been changed to October 6 due to the dry conditions in the park. The effects of the drought can be readily seen on the Black Cheery trees in the park. While oak foliage is still green the cherries have changed to yellows and browns and many leaves are starting to drop. Fred Urie tallied almost 600 Broad-wing Hawks flying over the nature centre on the morning of September 18. Friday, September 13: Chimney Swifts continue to roost at the Walkerville High School. J. Tuite and C. Baker counted over 350 swifts entering the chimney last night. Thursday, September 5: Large numbers of Chimney Swifts continue to roost each evening at the Walkerville High School. 450 swifts were counted diving into the school chimney last night (C. Baker & J. Tuite). The swifts are best viewed from near the tennis courts behind Walkerville High School (in Windsor, located at 2100 Richmond St., two blocks west of Walker Rd.). The swifts usually arrive near sunset (8:01 pm today), perhaps earlier during cloudy or cool weather. 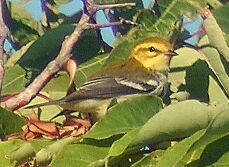 Wednesday, September 4: Point Pelee was bursting with warblers this morning. Ojibway's Weekday Warblers class was kept very busy as groups of warblers were encountered on all the trails. Tennessee Warbler was the most common species today and the highlight was a very good view of a Golden-winged Warbler. Swainson Thrushes put on a nice show with over a dozen swarming a small group of dogwood bushes laden with berries. Blue Jays, Sharp-shinned Hawks and Monarch Butterflies are becoming more common while orioles and kingbirds have mostly passed through the area. We also had a close look at a fresh Gray Hairstreak and good numbers of Black Saddlebag dragonflies at the tip.